Considering I made it 4 weeks past when I went into labor with Ashlynn, I was sure this child was going to enter this world in a complete opposite fashion. Instead, my labor and delivery couldn't have been more similar. Once my 39 week appointment passed, right before Thanksgiving, with the doctor telling me to plan on being pregnant a while longer - even after he told me I was at 2cm the week prior and now was saying I was barely that - was pretty discouraging. With Ashlynn arriving so early and this being my second go-round, I was really planning on a November baby and not December, even though my due date was December 6. After this news I figured I'd go past my due date and need an induction. I had been having irregular contractions for two weeks with little (or apparently retreating) progress. On Thanksgiving day, I actually felt pretty awful. I really thought there was a chance we'd be heading to the hospital that evening, but alas, once again the contractions never got frequent or painful enough to make the call. (Black) Friday, November 29, I woke up feeling pretty good. I actually felt pretty great most of the day. We had family visiting in the morning, hit Target together that afternoon - pretty sure my first time ever venturing out on Black Friday, and decorated our tree that evening. I think I headed to bed around 10-10:30, but was unable to sleep due to insane acid reflux. I had to sit completely upright in order to not feel like I was going to vomit. Finally, sometime between 11:30-12am, I fell asleep. ...only to wake up an hour later and realize my shorts felt wet (thankfully, I had been sleeping on a towel for a week). I ran to the bathroom and attempting to confirm it was indeed my water breaking. Having experienced this with Ashlynn, I was a bit more confident since it was definitely a slow leak which can ride the line of water breaking and bladder control. It was only apparent during a contraction, which at this point were infrequent and not even that noticeable. Once I was sure, I woke up the Husband to make the call for family to head over to watch Ashlynn and start packing up the car with our bags (and make some coffee for himself, knowing the hospital cafe wouldn't open until morning). We hit the road a little after 1:30am and were checking in by 2am. Paperwork and a check later, confirming my water had broke and I was at 2cm and 80% effaced, they told us to get some rest. As usual the Husband didn't hesitate and was out immediately as soon as we hit the lights. I tried to sleep, but it's pretty hard knowing you are going to soon be meeting a new family member! Around 6 am I woke him and paged the nurse to take me off the monitors so I could walk the halls and try to get things moving along. We came back about 30minutes later to get hooked back up and I labored in the glider until they came to check me again around 7am. I was now about 3.5cm and told to start thinking about the epidural and that the doctor would be heading in shortly. We walked the halls again around 8am this time with contractions becoming more intense. Still bearable to breath through, but definitely the type that completely stop you in your tracks. When I came back we had the epidural talk again. My plan this time around was similar with Ashlynn, while I'd love to go completely natural, I wasn't going fight the situation either given the circumstances. If I had arrived at the hospital dilated to a 5 and having active labor that was moving quickly, I might have given it a go. But, I had nothing to prove and while having a badge of an all natural labor would make me proud, it wouldn't make me a better mother, something I think I had a harder time accepting the first time around. Knowing that my contractions, once again like with Ashlynn, weren't regular enough to get me dilating to deliver quickly due to my broken water, I was going to be given pitocin. This time, it was suggested I get the epidural prior to being hooked up the drip, which I was happy about since the last time I was given pitocin it was increased quickly and my contractions went from intense but bearable to holyshitOMG within 20 minutes. Since you need to be completely still during the administration of the epidural, they like to do it before contractions are too much to bear. The anesthesiologist arrived quickly, 9:30am, and got started. I always get a bit freaked out during this process. Since there are (rare) risks and it's a pretty major needle and drug. Everything was smooth, even me sitting still through two contractions when I could tell something wasn't right. I heard him saying something about not being able to thread the catheter and felt different amounts of pressure. Then it felt like he started over, which I think he did. The whole ordeal took at least 10-15minutes, which is a pretty long time to stay completely still all while having contractions. I was freaking out there were going to be complications, but as soon as he finished I was already feeling less pain and starting to feel my legs go numb just like with Ashlynn. I was told to rest as they started the pitcoin drip. As soon as the nurse left and the Husband stepped out to call some family to let them know the progress, I felt like I was going to throw up. I paged the nurse and let her know, and turns out my already low blood pressure had crashed. The IV fluids I was supposed to be receiving, weren't getting to me since the IV in my left arm wasn't done right. I was severely dehydrated. The nurse had no choice but to redo my IV... in my right hand. I'm not scared of hospitals or even needles or shots, however, I do have a odd issue with IVs stuck in hands. I think it's from the few times my mother was hospitalized for some surgeries and illnesses when I was young and seeing the needle stuck in her hand with the veins, I don't know. Either way, I always request it be placed in my arm, which is never an issue since my veins are very visible and it's less bothersome since your don't use your arm they way you do your hand. Since I was so dehydrated, apparently the veins in my hands were all shriveled up and she had to try twice before getting it right. Once the fluids were getting in, I felt so much better were sure I was going to pass out. An hour later around 11:30 the nurse came in to check me. Just like Ashlynn, the combination of pitocin and epidural completely dilated me within an hour or so. She called the doctor to let her know I was ready and we started some practice pushes. Again, just like with Ashlynn, my epidural was so intense I couldn't feel anything. The best way to describe it is when you sleep on your arm and literally have to lift it up with your other arm to move it. I could feel touch, but had no control to move my muscles on my own - which meant I had no clue if I was pushing. Around 12 the doctor arrived and we pushed until 12:30pm. At this point, they turned down my epi so I could regain some feeling and had me labor down for thirty minutes or so (in which the doctor left to deliver the baby next door). When she returned I could feel enough pressure to make my pushes worth the effort. At 1:23pm Kenley Drew entered our world. 7 Pounds 9 Ounces, 21" long. Definitely hardwork, but no screaming, no mad rush, no sweating, and basically no pain. Just like my delivery with Ashlynn. I really couldn't ask for a smoother experience. With Ashlynn I only pushed for 10 minutes, but she was also 2.5lbs and 4" smaller and Kenley was also "sunny side up" (face up) which according to my doctor is a very difficult way to deliver. She was placed on my chest immediately and the Husband cut the cord. After, she was taken to get cleaned up, weighed, and have her APGARs (9/9), then she was given the chance to nurse in which she latched immediately - and this time around I knew she was doing it right. Littles is already a GREAT eater, and making the nursing experience so much smoother and easier than it was with Ashlynn. She definitely was a bit of crier at the hospital, where she was pretty unhappy unless nursing, turns out she was just hungry. When my milk came in the day we came home (Monday December 2nd), she finally fell into her pattern of eat, sleep, eat, sleep, eat, sleep, repeat. At just over a week old, she's a pretty easy baby and all three of us are just smitten. What a beautiful family. I hope I will like/do better with a second delivery since I would know what to expect more. Yay baby kenley! I'm so happy she's here, safe, adorable, and that her big sister loves her so much!! Can't wait to see her grow (just like Ashlynn!). Congratulations on your little family! So happy for you! Welcome to the world Kenley! So glad things went so smoothly! Love the beautiful pictures. Congratulations! I'm glad you had a smooth delivery. The picture of you with both girls is the sweetest! Awww love reading this and so jealous of your easy delivery and how great she is latching on! I am sure it's surreal going through it a second time and have more confidence with everything. I look forward to nursing again...I feel like I'll be so much more prepared! So glad she's settling right in and Ashlynn is adjusting. She's just perfect!! Loved reading your story and so glad for your family of four! I am always so interested by peoples' birth stories they can be so different! Gorgeous baby girl, good work mama! Hooray!! Congratulations on everything. I'm so happy to hear you are having an amazing nursing experience. Great job, mama. God, I love birth stories. What a beautiful one, girl!! Yay! So glad it went so smoothly, how wonderful! You three girls are the absolute cutest, excited for your sweet family Erinn! Xo!! Love this so much! Welcome baby Kenley! I can't wait to follow your sweet journey as a family of 4!!!! And really having a hard time believing we are almost there, too! Beautiful story. It sounds so similar to Owen's birth story. Fingers crossed Claire's will go just as smoothly! this is so sweet... and my are you beautiful after birth!!! I just love this! 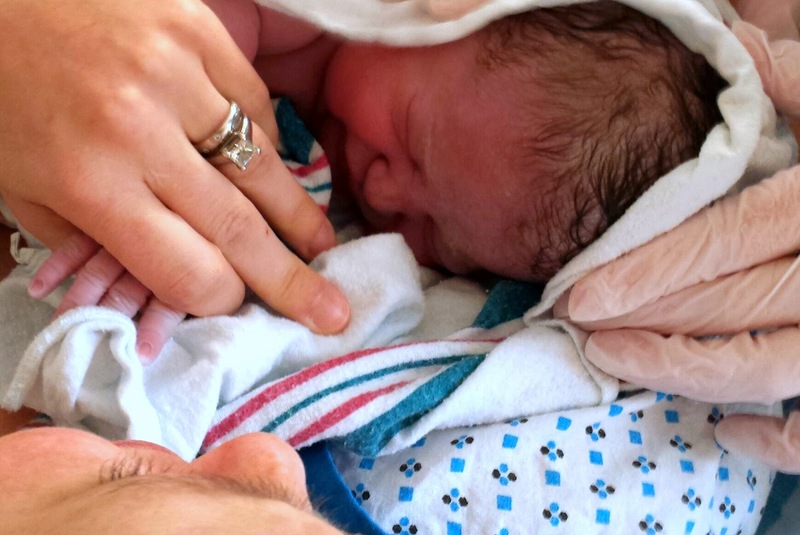 I was hoping we would see a birth story post but thought you might take your time and adjust to life as four! So glad you had another good experience and that Kenley is happy and healthy. Holiday Gift Guide - For Guys!